Pressure washers are used anywhere tough dirt, moss, and grime needs to be removed: on driveways, pathways, vehicles, decks, fences – you name it. We also carry a variety of specialized attachments – such as an extension wand – that can make your cleaning job even easier. Sharecost Rentals is Central Vancouver Island’s best choice for pressure washer rentals. 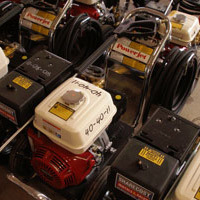 Our 2000 PSI Powerjet pressure washers feature direct-drive Honda motors and industrial quality Interpump water pumps. All units come on a wheeled cart and include wand, 50’ of hose, 3 high pressure nozzles and one soap nozzle. Our 3000 PSI Powerjet pressure washers feature direct-drive Honda motors and industrial quality Interpump water pumps. All units come on a wheeled cart and include wand, 50’ of hose, 3 high pressure nozzles and one soap nozzle. Our 4000 PSI Powerjet pressure washers feature direct-drive Honda motors and industrial quality Interpump water pumps. All units come on a wheeled cart and include wand, 50’ of hose, 3 high pressure nozzles and one soap nozzle. Pressure washer attachment. Extends from 6 to 18 feet. When you need more reach out of your pressure washer, turn to our telescoping wand. Simple adjustment of this wand extends it up to 18’. Need more pressure out of your pressure washer? Try our rotary nozzle attachment: it cleans deep down while maintaining a wide spray pattern. Pressure washer attachment. Cleans 16 inch wide path. Push this lightweight unit on its pair of wheels while four nozzles clean a 16” wide path. Great for washing sidewalks and smooth floors. Pressure washer attachment. Cleans 20 inch wide path. When pressure washing large areas there’s no better accessory than our 20” stainless-steel flat surface cleaner. Attaches to standard pressure washer fittings and features a trio of nozzles fixed to a rotary arm for fast, consistant cleaning. Rated up to 4000PSI/8GPM.